Will Immigration Policies Build a Wall Around Health Benefits? Possible overhauls to federal health-care programs including Medicaid and Obamacare could be complicated by another component that reduces the number of insured people: immigration policy changes. A Republican Congress and White House are working toward expected overhauls to the Affordable Care Act and Medicaid, which could reverse coverage for around 11 million newly insured people. What’s less clear is what will happen to the coverage for immigrants. “It’s interesting what a difference a couple of years can make,” Steven Wallace, a professor at the University of California Los Angeles focused on immigrant health policy, said. “A couple of years ago there was lots of discussion around how to improve immigrant health” and keep them as healthy as when they arrive, avoiding pitfalls that often harm them over time. Wallace told Bloomberg BNA the focus is being turned on its head. Wallace, citing 2016 figures from the Census Bureau Current Population Survey, said that about 19.7 percent of native-born Americans receive Medicaid, compared to about 19 percent of foreign-born population. More than 8 million immigrants were on Medicaid, compared with more than 62 million of the native-born population. Federal requirements mean undocumented immigrants cannot access Medicaid, except for emergency services and for unborn children who would become U.S. citizens, while legal immigrants have to wait five years to do so. Refugees do not have this five-year ban. 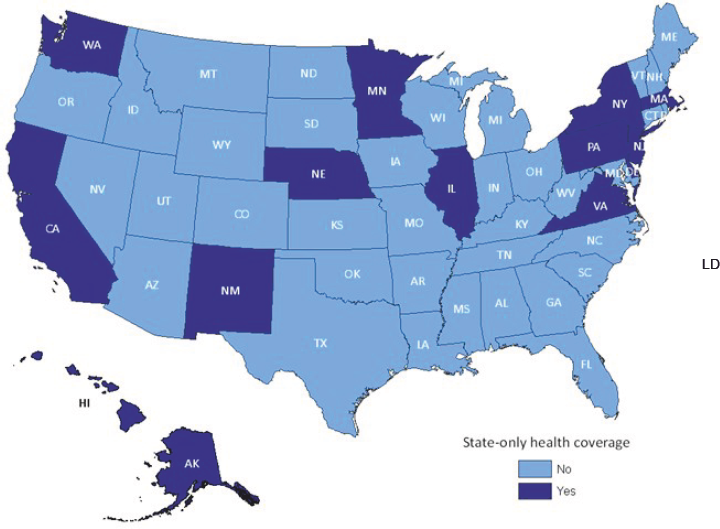 Though the majority do not, some states including California, Washington, Minnesota and New York also offer their own coverage options for immigrants during that five-year period, according to the HHS Office of the Assistant Secretary for Planning and Evaluation. Most immigrants using the coverage tend to use it just for services such as childbirth, according to one study out of North Carolina. One-fifth of noncitizens are on Medicaid, compared with more than one-quarter of their native-born and naturalized citizen counterparts, according to a 2013 Cato Institute study. After Republicans’ victories in the 2016 election, GOP lawmakers began carving out strategies to revamp health care in their image. Strong rallying cries to completely strip Obamacare have lagged, met by forceful Democratic opposition and difficulty reaching a consensus on replacement options. But away from the limelight of what will come of the massive health-insurance expansion, other undercurrents are brewing. With new, conservative Health and Human Services Department leadership and a Republican majority, the cards are firmly in place for a reshuffle of Medicaid, which now covers more than 70 million people. In a hint of what’s to come, Seema Verma, President Donald Trump’s pick to run the Centers for Medicare & Medicaid Services, called Medicaid’s status quo unacceptable in her first confirmation hearing. Opponents point to high spending projected to only grow—federal Medicaid spending is projected to reach $624 billion by 2026, according to the Congressional Budget Office—and poor health outcomes, as well as a desire to make the public benefit more of a temporary stop-gap for everyone but the most vulnerable and medically fragile. Together, growing conservative voices say spending on the $550 billion program is unsustainable as they pitch different forms of financing that will likely taper off federal funds over time. Bolstered by a president who has taken an aggressive stance on immigration from blocking refugees to promises of mass deportation and a wall on the southern border with Mexico, noncitizen immigrants using health insurance could be among the first to lose benefits, analysts expect. He believes that will mean cutting Medicaid coverage for any non-U.S. citizens—even those with green cards—nationally, as well as restricting states like California from pursuing or offering any of their own health-care options to those who aren’t naturalized immigrants. Nowrasteh, who supports the idea, told Bloomberg BNA he has heard that several lawmakers are currently working on these types of bill provisions. Already, one draft executive order leaked to the Washington Post and being closely watched by immigration and health policy analysts would aim to revise the boundaries of who is considered a “public charge,” which could bar an immigrant from naturalizing and full legal inclusion. It’s unknown how exactly the definition might be interpreted or tweaked. An administration spokesman said the White House doesn’t comment on draft executive orders that haven’t been released. During the 1990s, when welfare reform was passed under then-President Bill Clinton, lawmakers tightened Medicaid for immigrants with green cards by implementing a five-year ban for new entrants to the country before they could join the rolls. The move was also intertwined with restrictions on other public welfare benefits such as food stamps and cash assistance and homed in on people who were heavily reliant on government help, increasing sponsor responsibility for immigrants and tightening access to only emergency care for undocumented immigrants. With much confusion and uncertainty over who was deemed reliant, the administration released guidance noting that for Medicaid recipients, the restrictions fell only to those in institutionalized, long-term care. Public charge considerations, instead, weighed a wide range of variables including a person’s age, health, income and assets. The Trump proposal, or any others to follow, could theoretically undo that guidance and jeopardize legal status, one health policy analyst told Bloomberg BNA: For example, a student visa holder whose child is on the Children’s Health Insurance Program or a pregnant woman reliant on Medicaid for her pregnancy who’s attempting to live in the U.S. permanently could be at risk for deportation because of the use of benefits. “The disadvantage of doing that through administrative clarification is that it can be changed,” Wallace said. “My Republican colleagues say they are strengthening Medicaid by removing or excluding certain people from the program, claiming that it will allow for more resources to go toward others,” Rep. Frank Pallone Jr. (D-N.J.), ranking member on the House Energy and Commerce Committee, said. “This is a meaningless approach to resource management. The bill from Flores has not moved forward. Those supportive of immigrants say there has been no evidence that undocumented immigrants or others ineligible are pretending to be citizens to use Medicaid, or that those immigrants who are eligible participate at higher rates. Other suggestions, some of which have floated around for several years but laid dormant during the Obama years, are sprouting up and taking shape. “As with all things with the Trump administration, predicting what’s going to happen is done at the predictor’s peril,” Wallace said. “Given the current political climate and the busyness of the White House [and Congress] around closing borders—whether with trade or immigration or other ways—I’m sure you’ll see a plethora of bills introduced and some probably getting passed, and a couple getting signed, that have the intent and effect of making life more difficult for immigrants in this country whether they are here with or without papers,” he added. Nowrasteh said the signs point to more restrictions on foreign-born Medicaid beneficiaries. He noted that push could extend also to refugees and asylum-seekers fleeing their countries, currently exempt from the five-year ban, but said any changes to that policy would be more difficult given international law and treaties on asylum. Those treaties, which the U.S. has signed onto, require access to welfare benefits. “If the U.S. were to carve out withdrawing from that part of [any] treaty but still accept a certain number of people on our own terms, I don’t think international agencies would say no,” he said. Ultimately, analysts said, these types of shifts could take away coverage. "[The draft executive order] is almost like a backdoor way of changing an eligibility requirement without really doing so,” analyst Shelby Gonzales said, “because people would have to balance their priorities and decide I’m eligible for this program; my family needs this service during this hard time I’m going through for a while. But I don’t want to damage my ability to change my status in the future. “So it puts families in a very difficult situation of making decisions I can’t imagine having to do for myself and my family,” Gonzales, a health policy analyst with the Center on Budget and Policy Priorities in Washington, said. In California, where a 2015 law expanded the state’s Medicaid program, Medi-Cal, to all undocumented children under age 19, worries are especially pronounced. Around 175,000 have now enrolled in the health insurance, with thousands more still eligible, according to the Children’s Partnership in California, which promoted the law. Mayra Alvarez, president of the Children’s Partnership, notes immigrant children make up half of California’s youth and are the fastest-growing population in the U.S.
“These are the kids we’re going to rely on for our future workforce, going to rely on to help sustain the Medicare program, rely on to be future innovators and entrepreneurs; to ensure their health and well-being is critical to the success of not only California but the country overall,” she said. Wallace agreed. He said cutting immigrants from Medicaid rolls may save pennies but cost dollars in the long term by missing or delaying diagnoses of critical, expensive problems such as diabetes, hypertension, asthma or pregnancy complications before they hit the point of, for example, amputations or Neonatal Intensive Care Units. Gonzales believes it would be hard for the federal government to “tell California what it can do with its own state money” like for its program for the undocumented and hasn’t heard any talk of that to date. But Wallace said the changes could come indirectly. If Medicaid dollars are switched to lump-sum grants as many Republicans are proposing, the Medicaid and CHIP Payment and Access Commission, which advises Congress, estimates they could lead to billions of dollars in cuts. That would put further pressure on states to finance their programs and could lead to cuts in eligibility or benefits, he said, especially if another recession hits when there would be greater need but fewer dollars. 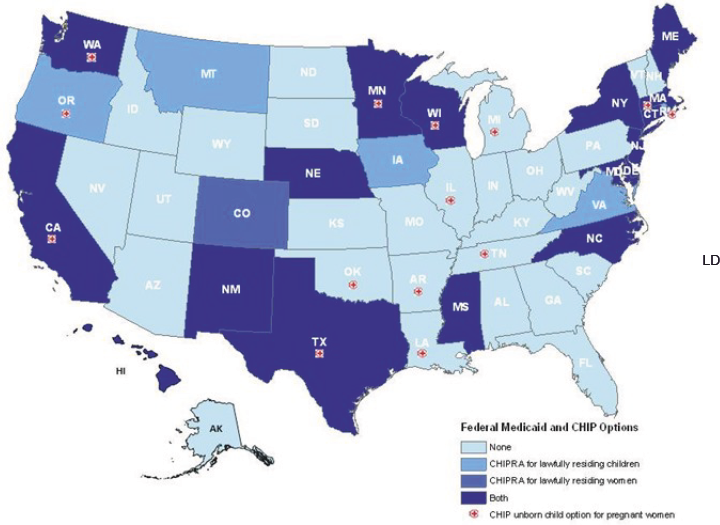 “Where do we cut Medicaid? That’ll put the children’s expansion at risk,” he said. Nowrasteh argues in favor of building “a wall around the welfare state, instead of the country.” He said cutting out benefits for noncitizen immigrants could change some minds on Capitol Hill to be more open to immigration. Meanwhile, it could ensure taxpayers don’t have to pay for public benefits for people not from this country, potentially saving a few billion dollars. As rumors swirl with little concrete verification of what to expect, one of the critical concerns analysts point to is that fears will stoke even people who are eligible or enrolled to skip either coverage or appointments. This chilling effect first began in the 1990s during welfare reform and is confirmed by studies. But others say they are already seeing its downsides. In the Golden State, families are canceling appointments at community health clinics, and there has been a “slow-down” in Medi-Cal enrollment, according to anecdotes Alvarez has heard. Meanwhile, clinic staff are trying to find more mental-health services to ease concerns over benefits and worries from families that they or relatives will be deported. Additionally, other experts noted, if changes go forward, U.S. citizens may be less likely to sponsor their relatives or other immigrants in case they would be held responsible for public benefits they might need.